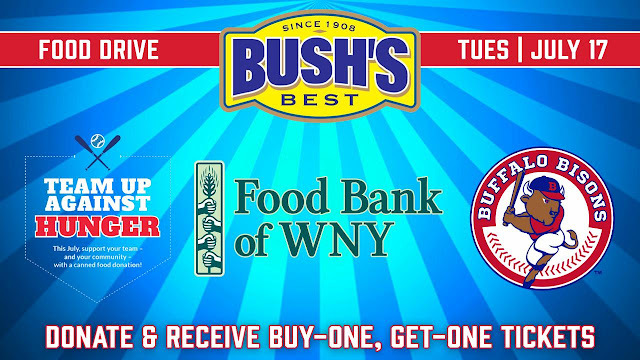 The Buffalo Bisons and BUSH'S Beans are working with the Food Bank of WNY to Team Up Against Hunger with a Food Drive during the team's game against the Norfolk Tides on Tuesday, July 17 (7:05 p.m.). Any fan that brings a non-perishable food item to the ballpark will receive a buy-one, get-one FREE Bisons Ticket to the game that night. Just make your generous donation at the BUSH's Beans table outside of the Swan Street Ticket Office or the Seneca Street Ticket Office to get a great deal on Bisons tickets. Already have a ticket to the game? -which also happens to be the Bisons' annual Italian Festival Night with postgame Fireworks presented by Unyts- your donations will get you a raffle ticket to win a 2018 Star Wars Night jersey (one raffle ticket per person). In its second year, this program encourages fans to bring non-perishable food donations to Coca-Cola Field and, inturn, fans receive this great ticket deal for helping to feed the local community through the Food Bank of WNY. Ninety Minor League Baseball clubs across the country will Team Up Against Hunger throughout the month of July. The month is significant as it marks the middle of summer break and a crucial time when millions of children are not receiving free or reduced-priced meals at their schools as they do when school is in session. The Bisons and BUSH's Beans are honored to partner with the WNY Food Bank of WNY to bring the issue of hunger to light using the MiLB platform.